Take a boat cruise on the Chobe River with a game drive. Chobe National Park is the second largest national park in Botswana covering 10,500 square kilometres, with the greatest concentrations of game found in African. The park is divided into four distinctly different ecosystems: Serondela with its lush plains and dense forests in the Chobe River area in the extreme north-east; the Savuti Marsh in the west about fifty kilometres north of Mababe gate; the Linyanti Swamps in the north-west and the hot dry hinterland in between. Chobe’s elephants are the largest surviving continuous elephant population which range over northern Botswana and the northwest of Zimbabwe, over 120,000 strong. The Chobe elephant are migratory, making seasonal movements of up to 200 kilometres from the Chobe and Linyanti rivers, where they concentrate in the dry season, to the pans in the southeast of the park, to which they disperse in the rains. Maun is a small town on the edge of the Kalahari Desert in Botswana. As a result, it’s a starting point for the Mokoro (dugout canoe) trip into the Delta. As you glide through the waterways, you will see a fantastic array of wetland wildlife, birds in particular. You will come across hippos in the water and elephants drinking from the shore. You can go on a walking safari to look for giraffe, buffalo and rare antelope – the overnight stay is a great wilderness. We bush camp and cook over open fires. Toilet facilities consist of specially dug holes. After returning to Maun you can take the scenic flight over the Delta. See the extra wildlife that you didn’t realize were so close to camp. The old home of Joy Adamson and Elsa the lion of ‘Born Free’ fame. Take afternoon tea on the lake shore with black and white colobus monkeys swinging through the thorn trees above. An ancient city built of stone, built by the ancestors of the Shona people. The name Zimbabwe means ‘stone houses’ in Shona. Built almost a thousand years ago over a period of 300 years, the ruins are unique in the region as few stone building were built in the early era. One of the few parks you can walk or cycle through. Not too many wild animals but superb volcanic scenery with; towering cliffs, water gouged gorges, stark rock towers, old volcanic vents and plumes of geothermal steam. This park featured in the film; Lara Croft: Tomb Raider – The Cradle of Life. The park is the base for a geothermal power plant. Karatu is a colourful bustling town and the gateway to the Ngorongoro Highlands. It’s a fun place to visit to practice your bartering for souvenirs. Rough and delightful, the road through town is vibrant with people in brightly coloured clothes chatting, laughing and going about their daily activities. Outside Karatu, rolling hills merge into the Ngorongoro Highlands. Here, mountainsides are covered in thick forest and cultivated areas are filled with farms and coffee plantations with villages scattered in between. Waterfalls tumble over rocks, sunbirds flit from flower to flower and elephant and buffalo follow ancient paths through the vegetation to rivers to drink and to mineral-rich caves to extract salt. 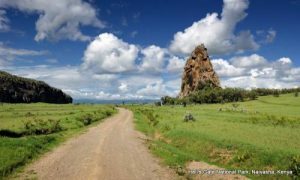 Kenya – is set on the southern border of Kenya some 4 hours drive from Nairobi on a massive plain. The animals you are most likely to see are; lions, buffalo, elephant, giraffe, zebra, gazelle, hyenas, wildebeest and some rhino. The most impressive site in the park is the great migration of the wildebeest from July to October. Here you can hand feed giraffes while you stand head high with the giraffes. 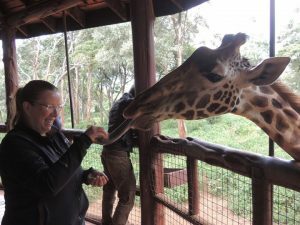 It’s a side trip in Nairobi with an entry fee of $7 plus a charge for giraffe food. 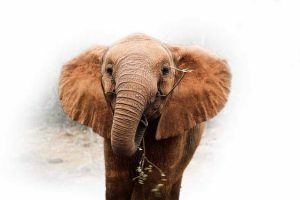 Stand with baby elephants and rhinos which have been rescued from the wild; normally their mothers have been poached and are now fed from the bottle. It’s a side trip in Nairobi, open every day, from 11:00 am till noon. During this time, the baby elephants arrive for bottle feeding and a mudbath. The lake in the west of Uganda is our base while groups are off trekking to the mountain gorillas. It’s a highland mountain lake in quiet surroundings where you can row around the lake, swim and bird watch. Lake Eyasi is remote and different. The lake itself varies considerably in size depending on the rains and supports a mix of water birds, including huge breeding-season (June to November) populations of flamingos and pelicans. In the dry season, it’s little more than a parched lakebed, lending to the rather otherworldly, primeval ambience of the area. Stretching for 50 km along the base of the rusty-gold 600-metre high Rift Valley escarpment, Lake Manyara is a scenic gem, with a setting extolled by Ernest Hemingway as “the loveliest I had seen in Africa”. A large shallow lake surrounded by a park on the edge of Nakuru town. The big three here are pink flamingos – sometimes millions of them, rhino and tree sleeping lions. Also living in and around the lake are; pelicans, cormorants, leopards, baboons, giraffe, waterbuck, rock hyrax and birdlife. The alkaline water in Lake Natron has a pH as high as 10.5 and is so caustic it can burn the skin and eyes of animals that aren’t adapted to it. The water’s alkalinity comes from the sodium carbonate and other minerals that flow into the lake from the surrounding hills. Deposits of sodium carbonate — which was once used in Egyptian mummification — also acts as a fantastic type of preservative for those animals unlucky enough to die in the waters of Lake Natron. Lake Malawi; it’s is a special beach resort orientated to budget beach activities. Snorkel around Kande Island. If you’re feeling fit, swim the 800 meters out. If you want to take it a bit easier, rent a paddle boat or canoe. If you’re up for an all day cooking job, bargain with the locals for a pig and spit roast it. SCUBA Dive the freshwater lake. The local people, the Chagga, don’t even have a name for the whole massif, only Kipoo (now known as Kibo) for the familiar snowy peak that stands imperious, overseer of the continent, the summit of Africa. The ascent of the slopes is a virtual climatic world tour, from the tropics to the Arctic. Even before you cross the national park boundary, the cultivated foot slopes give way to the forest; elephant, leopard, buffalo and other small antelope and primates. Higher still is the moorland zone, where a cover of giant heather is studded with giant lobelias. Namibian Atlantic Coast. This is where the first European explorers landed in the 15th century. It is now more famous for the seal breeding colony. It might not smell great, but the sight of so many Cape Fur Seals is quite impressive. The scene varies from season to season. Certain times males are fighting for mates. Pupping season brings not only adorable seal pups but ravenous jackal taking advantage of the weak newborns or, as they see them, easy meals. Cape Fur Seals are really a type of sea lion, which are only found along the coast of Southern Africa. Namibia’s Etosha pan is a large salt pan, forming part of the Kalahari Basin. The dry lakebed is 120-kilometers long (75-miles). During the day we drive through the park in the truck to various waterholes where animals may congregate. We may see elephants, rhino, lion, leopard, springbok, oryx, kudu, mongoose, and even the elusive giraffe and zebra. In the evening, walk from the campsite to the illuminated waterhole, it’s very busy with animals coming to drink, especially in the dry season. Kamanjab, Namibia. Cheetahs are a threat to livestock which is a major industry in the area. Farmers and ranchers will often kill this endangered animal when one is suspected of taking down cattle, goat, or sheep. The family that runs the Cheetah Farm doesn’t like to see that happen and instead catches problem animals and releases them onto their expansive but enclosed property thereby saving the cheetahs and the livelihood of local ranchers. You can pet and play with the tame cheetahs up at the ranch house. In the afternoon, ride out to the fields to see the cats being feed. Quad-biking – Take an intense two hour venture into the Namib desert. Ride the roller-coaster dunes in control of your own off road vehicle while following an experienced guide. Not to be missed. For both mild and wild quad-bikers. The river forms the border with South Africa, here you can spend the afternoon canoeing on the river. Kruger National Park is one of the largest parks in Africa; you should see the big 5 here. On the border of Mozambique, it’s a great for day and night game drives with lots of; elephants, lions, hippos, buffalo together with rhino. On the Great North Road, in southern Tanzania, it’s covered by savannah woodland. Follow the highway through the park we often see elephants and antelopes. Arusha is Tanzania’s safari hub. From here, you can take a trip to the Serengeti and the Ngorongoro Crater. The Serengeti plains are the Africa of the movies. Immense herds of zebra and wildebeest migrate here to and from Kenya’s Masai Mara together with their accompanying predators. Leopards and lions are often spotted. All the big five can be found in the park. That is if luck is with you. Your campsite is rustic offering the rare opportunity to fall asleep (or lay nervous and sleepless awake) to the sounds of lions or hyenas. Breakfast and box lunches are provided during the day and dinner is prepared for you by your cook at night. After game driving in the park, you’ll head out, past Masai villages and Olduvai Gorge, to the Ngorongoro Crater. Come morning you’ll wake up early and do a game drive in the unique ecosystem of the crater, where there are plenty of lions, black rhino and elephant. Stone Town – a UNESCO World Heritage Site, the old slave market, the spice growing areas, Jozani Forest with Red Colobus Monkeys and in the evening visit the seafood cafes and have dinner on the wharf. Africa House – Enjoy cocktails and maybe a water pipe as you watch the sunset over the Indian Ocean from the balcony of this historic hotel. Zanzibar Stone Town! Night Market – Browse the stalls for seafood and sugar cane juice. Try a Zanzibar Pizza. Spice Tour – Tour historic Stone Town and the slave chambers. Visit the local market as well as spice plantations. Have a traditional meal in a local’s home. Add the Jozani Forest to the day’s activities and see the endemic Zanzibar Red Colobus Monkeys. Snorkeling – Take a dhow out to the reef that lies off a private island. Snorkel the reef and then sail back to a secluded beach for a fresh fish meal before returning to Nungwe. SCUBA Diving – If you’re a certified diver, visit one of the dive centers and check out the dive sites. If you’re interested in learning, start your dive course. Deep Sea or Reef Fishing – Hire local to take you reef fishing in a dhow, or go with a professional outfit for deep sea fishing. Natural aquariums – Feed the resident sea turtles and even swim with them during high tide. Sunbathe and relax on the beach – Catch up on your diary or book. Swim in the warm water. Beach Bars – Start early or spend a late night at one of the beach bars. Herds of up to 300 elephants scratch the dry river bed for underground streams, while migratory wildebeest, zebra, buffalo, impala, gazelle, hartebeest and eland crowd the shrinking lagoons. It’s the greatest concentration of wildlife outside the Serengeti ecosystem – a smorgasbord for predators – and the one place in Tanzania with dry-country antelope such as the stately fringe-eared oryx and peculiar long-necked gerenuk. With less than 800 mountain gorillas in the wild, we see the biggest primate in either; Uganda, DR Congo or Rwanda. Trekking to see them is expensive however well worth it according to everyone when they return from sitting beside the wooly giants. There are four parks you can visit the gorillas in three different countries. Three of the parks form a super park meeting on the borders of the three countries. Most of the gorillas live in Bwindi, which is where we try to see them. These parks are covered in rainforest and thick bamboo. Aside from the gorillas other animals you might see while trekking to the gorillas are colobus monkeys but the thick forest makes game spotting hard. The trek to gorillas can take, if you’re lucky, less than an hour, to all day long. The trekking is done with ranger guides who follow the gorillas from their previous night’s nests. (They do build nests in trees or on the ground every night to sleep in). Once you reach the gorillas, you sit with them for an hour, while they normally feed or relax near you. There are a number of rules to follow when you’re around the gorillas, the guides will show you how to follow. A lightly forested park on the Luangwa River in the south east of Zambia. Animals normally seen are; hippos, elephants, crocodiles, antelopes, water and bushbuck, wild dogs, lions, and even more buffalo. We camp on the river bank beside the park. You can do both day and night game drives into the park. Leopards can sometimes be spotted on the night drives as the park, which has one of the highest concentrations of leopards in Africa. The road up to the park is dirt and the park is part of vast swamp system, so from January up to March as the road can be flooded, then it is possible that we can’t get in until the water recedes. The Zambezi River drops 100 metres over a mile wide chasm, creating one of the most incredible natural wonders of the world, which seems like smoke from a distance. When the river is in full flow, the water roars, sending a cloud of spray 500 metres into the air. Victoria Falls is on the border of Zimbabwe (Victoria Town) and Zambia (Livingstone). Adventure activities here are; bungee jumping, white water rafting, game-viewing on horseback, canoeing, light aircraft or helicopter flights over the falls and the sunset cruise on the Zambezi, walk with lion cubs.